The Seasonal Worker Program (SWP) was established in 2008, initially as a pilot, then in 2012 as a permanent program, to help meet the labour needs in Australia’s horticultural sector and to provide labour mobility opportunities to Pacific islanders. Despite continuing growth, the SWP remains small in comparison both to the overall number of workers operating in the sectors it covers and to New Zealand’s equivalent Recognised Seasonal Employer Scheme. For the SWP, the binding constraint remains low employer demand. Why aren’t more employers demanding SWP workers? And what reforms would increase employer demand? 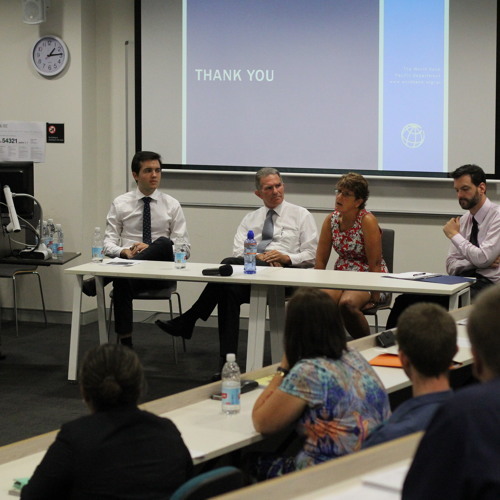 Jesse Doyle from The World Bank and Stephen Howes from ANU presented findings from a joint World Bank-ANU survey undertaken in 2014 of employers and industry associations across the Australian horticulture industry, and it was followed by a panel discussion with stakeholders involved with seasonal migration. Mr Axel van Trotsenburg, World Bank Vice President for East Asia and Pacific, chaired this public forum.